ORLANDO, FL--(Marketwire - August 27, 2010) - There's still plenty of time to create an extraordinary family vacation at the Orlando Marriott World Center that will intrigue the senses with fabulous and affordable resort packages in Orlando. Whether dining with Shamu or taking an adventurous deep dive with the sharks, Orlando vacation packages that include SeaWorld™ and Aquatica™ "Length of Stay" park tickets for up to 14 consecutive days are a great way to spend some quality family time. At the Orlando World Center Marriott Resort & Convention Center, the amazing SeaWorld Orlando Kids Play & Stay Free Package offers guests deluxe accommodations at one of the finest luxury resorts Orlando has to offer, along with tickets to SeaWorld, a SeaWorld Welcome gift and a SeaWorld Guest Value Card with special park offers including a free upgrade to preferred parking, 50% off child's dinner at Dine with Shamu, $10 off Sharks Deep Dive ® and $10 off Makahiki Luau ®. With the Orlando Marriott resort's Aquatica & SeaWorld Package guests will receive "Length of Stay" tickets to both Aquatica and SeaWorld, a free plush toy for each child and a SeaWorld Guest Value Card in addition to deluxe accommodations. With "Length of Stay" tickets, hotel guests will have the option to "come and go" as they please at both parks for up to 14 consecutive days from their first visit. With plenty of shows, exhibits, rides and special events SeaWorld offers year-round entertainment for the entire family and a unique opportunity to gain an understanding of ocean life. Aquatica, SeaWorld's waterpark, offers exciting rides such as the Dolphin Plunge, Roa's Rapids and the Taumata Racer, just to name a few. With fun and activities for all ages, the two parks combine to create a family adventure everyone is sure to remember. Special package rates start as low as $212* and are valid through Dec. 31, 2010. To take advantage of these exciting offers, guests must use the promotional code THM when visiting www.Marriott.com to book accommodations or may call 1-800-644-2885 for reservations or information. 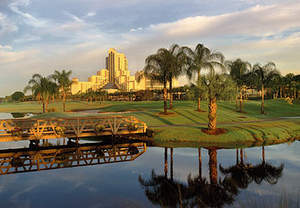 The Orlando World Center Marriott Resort & Convention Center Hotel is a pristine Orlando, Florida golf resort offering a spectacular getaway destination for both leisure and business travelers. Opulent amenities, an endless offering of poolside fun, a championship golf course and on-site luxury spa, all located near popular Orlando attractions make this hotel an easy choice for Florida travelers. *Offers are valid seven days a week, based on availability, through 12/31/10. Rates vary by hotel property and season. Rates for Kids Play & Stay package include children ages 17 and under staying in the same room. Offer does not apply to groups of 10 or more and may not be combined with other discounts our promotions. Advance reservation is required and the type and amount of tickets vary, please read rate rules when booking. Guest Value Card will be presented upon check-in, present key card envelope to receive the above mentioned benefits. For ride-again privilege present key card envelope after your first ride, restrictions may apply. Please visit hotel website for additional terms and conditions. We are located on 200 lush tropical acres and surrounded by our championship Hawk's Landing Golf Course.